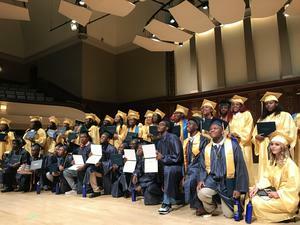 RACS Class of 2018 had a more than 90% graduation rate! ROCHESTER, N.Y. (WROC-TV) - A math teacher at Rochester Academy Charter School seems to have solved a perennial problem. He knows how to help students love learning. For that, he's receiving this week's Golden Apple Award. Senator Joe Robach, Monroe County Sheriff Patrick O'Flynn, Deputy Chief Dave Phelps and Town of Greece Councilman Brett Granville honored us with their presence at our ribbon cutting ceremony. Check this amazing Democrat and Chronicle story written by one of RACS parents! RACS National Honor Society members volunteered in the annual Rochester Clean Sweep on Saturday, May 6th. On Friday, May 5, our college bound senior students were featured on the City of Rochester's social media accounts. On Monday, May 1, we celebrated our graduating seniors and their college decisions! On Tuesday, April 25, we held our RACS Career Day for our high school students to explore career paths and opportunities! Our Turkish language and culture classes organized a celebratory evening featuring food, music and dance!